I'm back online (almost), and just in time for the holidays! Hopefully you have been enjoying the reposting of my favorite topics from the past few years. Instead of writing about the rather limited amount of cooking in the past few weeks (barring copious amounts of time spent on truffle making), or step onto my soapbox for eco or agro rant, I decided to settle with an infographic. If you ever wonder what it is exactly that my work focuses on, this diagram actually says a lot. It depicts why thinking about crop diversity and sustainable agriculture practices are important, yes, but also why looking beyond the farm level makes so much sense when trying to plan for climate change implications. A lot of this is about spreading risk and boosting the 'health' of the system as a whole so it can withstand stress better - sort of like if you build up your immune system, eat healthily, exercise, etc. your less likely to come down with a cold in the winter. Hmm, maybe I should start building the resilience of my own system! 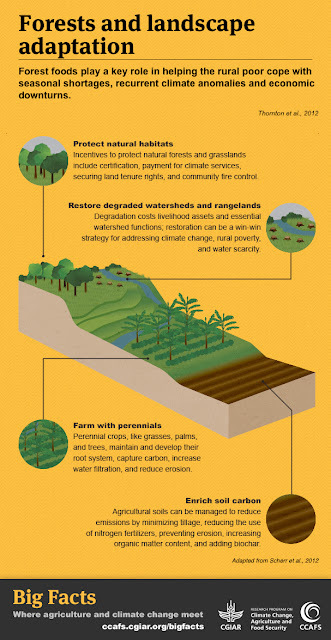 There are other cool infographics and "big facts" on the Climate Change, Agriculture, and Food Security (CCAFS) research program website, so make sure to check it out! Stay tuned for our regularly scheduled programming back up on Monday.